DETROIT – The end came much like this series, not with a boom, but with a little fly ball that fell through the 10th inning raindrops and onto the Comerica Park outfield grass for a single that would win the San Francisco Giants the 2012 World Series. In a series where new heroes come nightly and from a roster of anonymous names, the star would be second baseman Marco Scutaro, whose fly ball fell in front of Detroit Tigers center fielder Austin Jackson. It scored journeyman infielder Ryan Theriot, who slid across home plate for what would be the winning run in a 4-3 victory in Game 4 on Sunday night. And after closer Sergio Romo struck out Miguel Cabrera for the final out, the Giants raced to the center of the infield to celebrate their second World Series championship in three years. It's the franchise's seventh world title. Pablo Sandoval was voted World Series MVP after batting 8 for 16 in four games, doing most of his damage in Game 1 with a historic three home run performance. 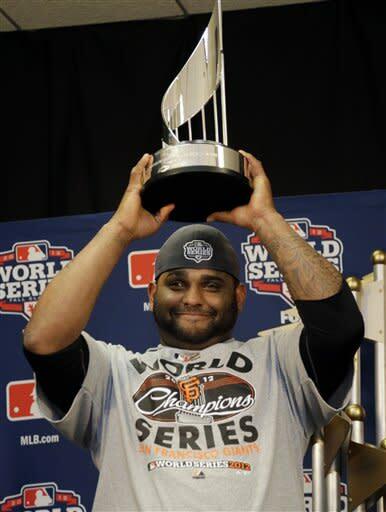 "My mom sent me a text and said don't wake up," Sandoval said of his dream-come-true World Series. As for the other big hitter entering this series, it was fitting that Cabrera was the final out Sunday. After all, it was the failure of Detroit's big hitters, primarily Cabrera and Prince Fielder, that led to the Tigers' demise in this series. Their silence had as much to do with San Francisco's sweep as the Giants' resourcefulness. In dispensing praise, Giants manager Bruce Bochy had a big helping for Romo, who seized the closer role in place of the injured Brian Wilson. "Sergio, he's the guy you want out there. He's not afraid," Bochy said. "He saved us all year when we lost [Brian] Wilson." Like they have in this World Series, the Giants scored first Sunday. Only unlike the other games, they couldn't hold onto the lead. Hunter Pence hit a fly ball in the second inning that rose high toward center field and carried over the heads of the outfielders before finally bouncing on the warning track and dropping over the fence for a double. The next hitter, Brandon Belt, hit a fly ball down the right-field line that smacked against the fence. By the time the Tigers got the ball back to the field Belt had a triple, Pence had scored and San Francisco was up 1-0. The lead disappeared an inning later when Austin Jackson walked and two batters later Cabrera hit what appeared to be a routine fly ball to right field that got caught in the roaring wind and carried until it disappeared in the crowd for the Triple Crown winner's first home run of the World Series. For Detroit, though, the problem was that pitcher Max Scherzer couldn't hold the 2-1 lead. In the top of the sixth he gave up a single to Scutaro and then two batters later he got a 1-0 changeup over the middle of the plate and Giants catcher Buster Posey pulled it down the left-field line. The ball curled just inside the foul pole for a home run that sent the San Francisco players running and jumping in their dugout. The 3-2 lead lasted two batters into the bottom of the inning when Delmon Young hit a home run to right to tie the score 3-3, where the game would be stuck until Theriot and Scutaro won it in the 10th inning. "It was freaky. I would've never guessed it," Tigers manager Jim Leyland said of his team's inglorious demise in a postgame TV interview. "There was nothing fluky about it."